For 15 years we have warned our children about meeting people they have found on the internet. So today we are off to Cirencester Caravan Club Site to meet some people that we have met on, yes, the Internet. If this is our very last blog you know why, although if it is published we have probably survived the encounter. We did actually meet Twittering friends and vloggers, The Trudgian’s for a quick ten minute chat at the NEC a couple of weeks ago, found out they were in Cirencester for half term and decided to join them for a couple of nights. Autumn is upon us the roads are lined by the most magnificently coloured trees. Leaves fall and dance in the road ahead of us, this season really is quite magical. It’s still not that cold, I’m still in short sleeves and fit flops and The Boss is still sporting shorts. Although, to be fair, he wears shorts all year round, even in the depths of winter. Pulling into the site, we joke that we may have the choice of one or maybe two pitches. We weren’t far out, there were maybe only half a dozen to choose from. Trying our best to choose one that wasn’t sheltered by trees, on a slope and of course it had to have a good people watching view. Pitch selected, blue jobs and pink jobs done, kettle on in just over half an hour. On our drive in we had been looking out for The Trudgian’s ‘van. 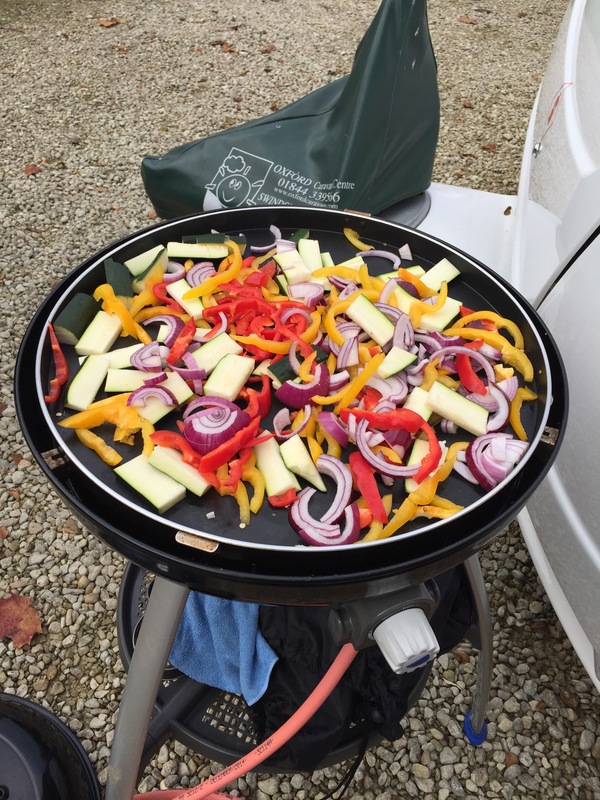 We were pretty sure we’d spotted their unit and its recently cleaned and vlogged about roof, How to clean your caravan roof, albeit now full of leaves and helicopters. Quick text and we see Dan striding across the site towards us. Kettle on, tea brewed and instant chat and laughter. Despite being relatively ‘new friends’ I am aware that our risqué sense of humour is common ground. 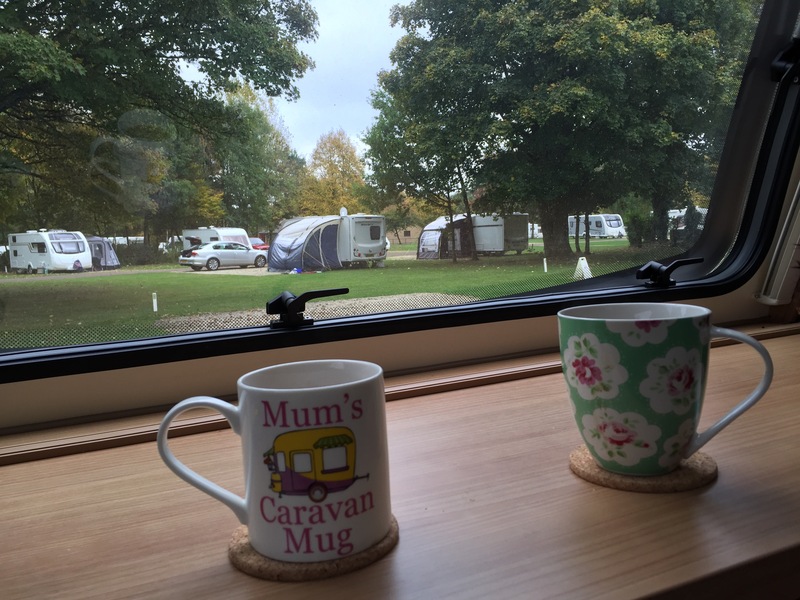 Angela follows armed with mugs (with an impending service on the horizon we have all but stripped our caravan to bare necessities and extra cups have gone). It’s now mid afternoon and the site is alive, we spot (what shall we call them?) Jack and Vera mooching and dog walking. Matching walking shoes, matching trousers, matching dogs but clashing with vibrantly coloured pink and orange T shirts. Perfect advertising for Cotton Traders. They mooch slowly along peering into caravans whilst appearing not to peer. Coming the other way Ethel and Harold are heading back to the warmth and comfort of their home from home. Bungled up from head to toe, despite the still relatively mild temperatures, hats are pulled down tightly around their ears, walking sticks in hand they stride with purpose and meaning. Evening arrives and temperatures start to fall, squirrels scuttle in the leaves collecting stocks for the winter. This brings out more people as the mist starts to settle amongst the trees. An older floppy hatted couple wrapped in Afghans looking like John and Yoko wander past holding hands and giggling. Just before the evening starts to get messy we take a walk around the site. Light starts to quickly fade and lights start to glimmer within the home from homes. 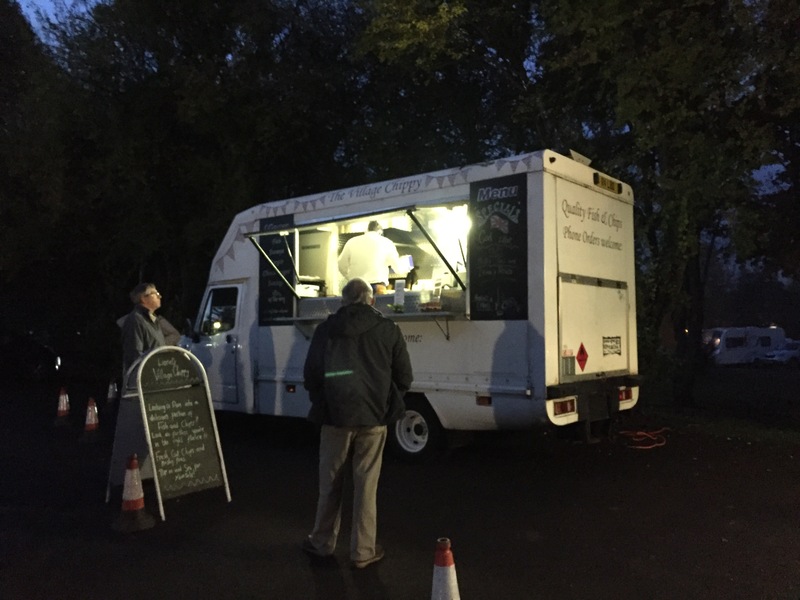 People are attracted like moths to the lights and salty, vinegary smells wafting from the mobile fish and chip van visiting the site this evening. On we wander into the mist gazing through windows into the warmth. I wonder what names the people inside have bestowed upon us? Mavis and Ian? Who knows. Our evening entailed an invite across to the Trudgian van. Lashings of ginger beer were consumed and of course a little splash of, erm gin. (Edit from The Boss, it was more like ‘lashings of Gin with a splash of Ginger Beer’) Conversation and loads of laughter followed making my eyes leak. Gone midnight and we are trying to stumble quietly across a sleeping site. Morning after I’m up an at ’em. The Boss nurses a headache and stays in bed a little while longer moaning about how much banging and crashing I’m doing with plates and cutlery. Do I really need to open and close every cupboard door 28 times! The warden is also out to get on his nerves. He drives around collecting leaves whilst leaves continue to rain down around him, the engine noise is now pounding in his head. Moaning that he isn’t going to get any peace he grumps off to the toilet block. Returning looking a little bit happier he suggests a walk into town. Off we set with the task of finding more ginger beer and something to throw on the barbie later. 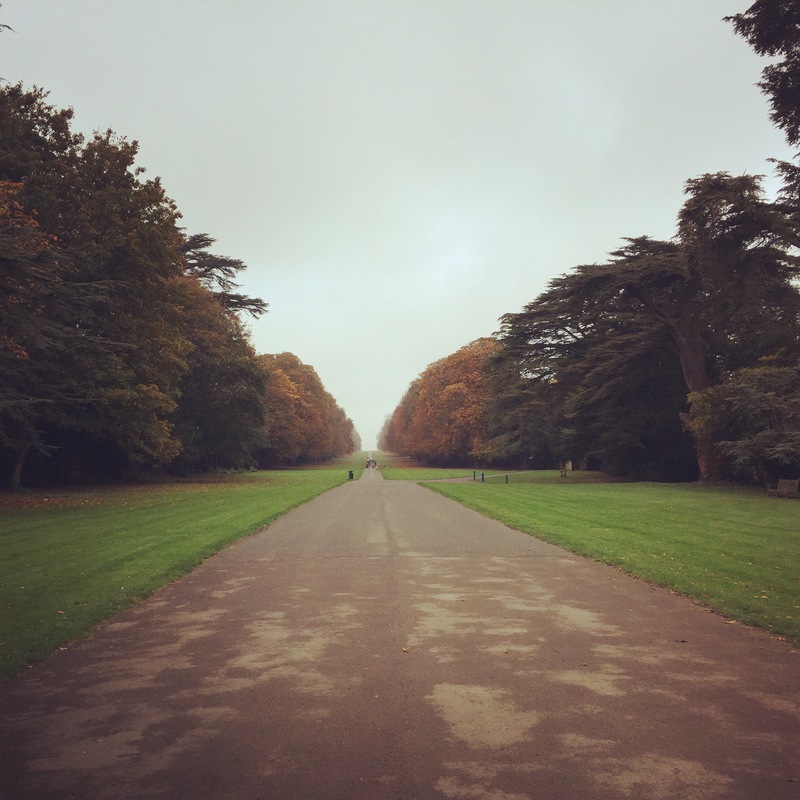 The walk through Bathurst Estate is in all it’s autumnal glory. Leaves in various shades of browns, greens, orange, red and even a shade of pink. Supplies found, we start to head back towards the afternoon nap that is calling the Boss. We pass Cotton Trader models, Jack and Vera, still sporting matching outfits, different clothes to yesterday but still matching. Polite nods are exchanged as we pass on the pavement whilst I try to stifle my giggles. One or two ‘blue jobs’ to do before our siesta. Water, waste and loo all need attention. Off he trots to the chemical disposal. 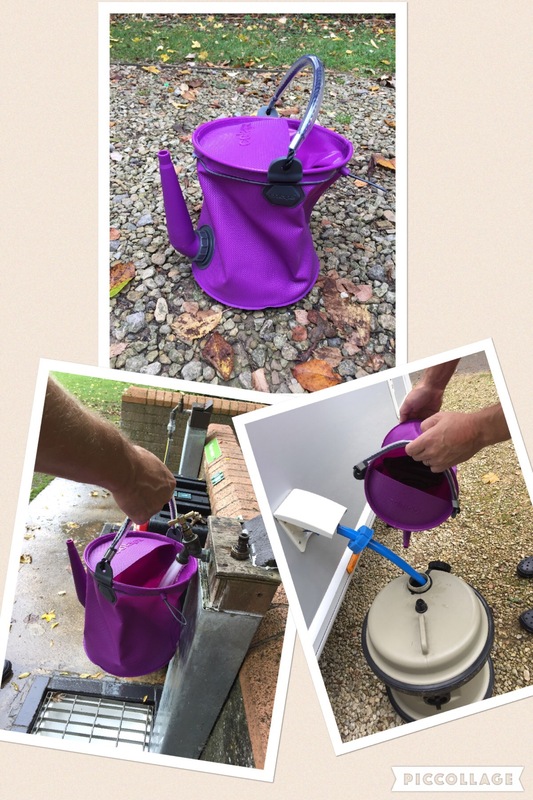 On his return I get out our newly acquired Colapz 3 in 1 collapsible watering can, bucket, dispenser. Time to fill the aqua roll. With only being here a couple of days it just needs a top up. Time to try it out. We’re going to use this ‘Deggin’ Can’ (another northern term) a bit more and I’ll let you know how we get on with it. So far so good! Nap over and we are ambling down to throw a shrimp on the barbie with Dan, Ang and their youngest, Chloe. Point to note, on arrival their camera stands proud pointing towards the collection of chairs huddled around the Cadac. Goodness only knows what footage will be collected this evening. Quite looking forward to seeing the Cadac being used. It’s one of those items that I regularly tell the Boss that we ‘need’. Now could be its moment to shine and show him that I really do need one. Enid Blyton may have been a bit disappointed with us tonight, we were ginger beer lightweights. Calling it a night at around 10pm we headed back with quite clear heads. The following morning is dull and damp. Shirley Temple is running round in wellie boots with a red coated Lassie, blonde curls flying behind her, laughing as leaves fall from the trees all around. It’s amazing seeing children take so much pleasure from the great outdoors with not an electrical appliance in sight. Dad stands quietly on the path, hands dug deep into his pockets watching Shirley and Lassie have the time of their lives. Breakfast and a brew done. Time to pack up and head back. The sunshine was just starting to push away the clouds as we hitched up and set off on the long drive home. Goodbye The Trudgian’s, till next year, it’s been great. Thank you so much Julia. Thanks Paul. Comments mean so much to me. You’ve given me ideas for future blogs. Jobs and tea to be included. 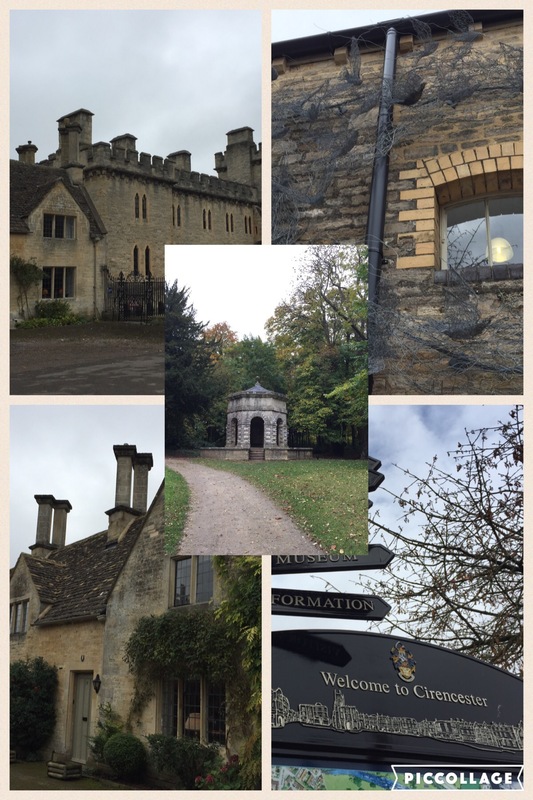 Love reading your blog’s…keep them coming!